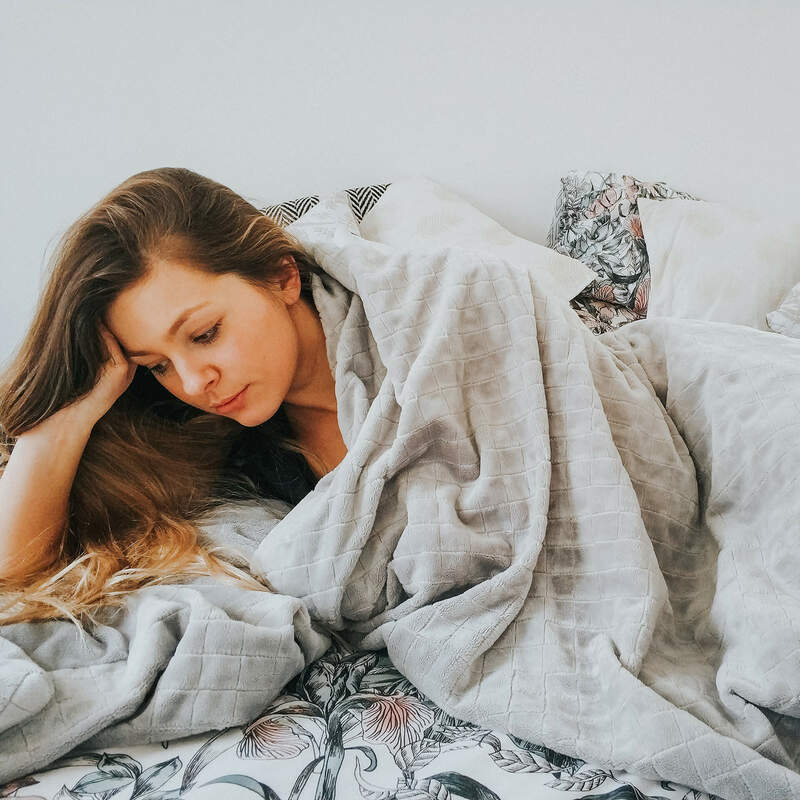 Weighted Blankets - Gravityblankets UKBlogHow to take a nap during the day and still sleep well at night? Without a nap during the day, you cannot function well, but at night, you struggle to fall asleep. How to take a proper short nap during the day and still sleep well at night? In the afternoon, slightly after 2 p.m. our organism tends to slow down. Our intellectual skills and body temperature drop. This is a perfect moment for a nap. We may assume that during the day there is no better moment for a short nap than the time between 2 p.m. and 4 p.m. Earlier, we are usually still rested after the night, besides, most of us start work or school before noon. Late naps can disturb your daily sleep rhythm. Why is it worth taking a nap during the day? Each dose of a healthy sleep reduces the risk of developing type II diabetes, neurosis, depression, stroke and heart disease. Taking a nap helps us stay in good shape because when our body is relaxed, it produces fewer substances that increase hunger (ghrelin and leptin) and we are less willing to reach out for fatty foods or sweets. Is it worthwhile to find time for a nap? It is scientifically proven that a short nap during the day regenerates our body, increases energy, makes us more focused on our tasks, helps us think faster and improves our mood. A nap may even sometimes save lives. Can you imagine a driver whose eyes start to close while driving? What about an exhausted surgeon operating on a patient or a sleepy flight controller? People, who have disregarded the role of sleep for proper body function, should take into account just three of the above examples, when the lack of even a short nap can hinder the performance of certain activities. A researcher at the University of California, Sara Mednick has distinguished several types of naps, differing in length and their impact on the body. The first one is the shortest and it is called a nano nap, which lasts up to 20 seconds. We usually take such naps on a bus or train. In this nap group, there is also a nap that is no longer than 1-2 minutes. The impact on the body of such minimum doses of sleep is not yet recognized. A micro nap lasts from 2 to 5 minutes and eliminates the feeling of drowsiness. It is worthwhile taking one during a break in a long car ride. Keep in mind that it is not recommended to drive a vehicle for more than 2 hours without a break. After this time, a short break should be taken. It is the perfect time for a 2-5 minute nap and then getting out of the car to get some fresh air. If you are taking a long journey by car, you should plan some longer breaks with a 5 to 20 minutes nap (the so-called mini nap). This way you will definitely improve your concentration. A nap of 20 minutes (2 in 1) is the perfect time spent regenerating the body during the day. This way we recover energy, get rid of drowsiness (an advantage of micro naps) and generate a new level of focus (a feature of mini naps). A nap between 20 and 50 minutes gives us as much as a 20-minute nap, plus it clears our mind from unnecessary information. A one-hour nap is recommended for all of those doing creative work because a 60-minute sleep – just like shorter naps – regenerates our vitality, strengthens concentration, clears our mind and improves creativity. When is it worth to take a nap? The moment when we take a nap has a significant influence on the effects we will achieve. A short sleep between 2 p.m. and 4 p.m. has the best impact on our body. At this time we start to feel tired, our concentration level is lower and we take more time to react. A weakened body and mind can reach the deeper phases of sleep faster and therefore regenerate more thoroughly. It is worth noting that a nap taken too late may not be a good idea. Sleeping after 4 p.m., especially for a longer time, may disturb the daily activity rhythm and make it difficult to fall asleep, as well as worsen the quality of sleep at night. How to take an effective nap? When you are asleep, the world does not stop. The sun shines through the curtains, kids are outside playing, and your better half is cooking dinner. Light, noises or intense scents can prevent you from falling asleep, so it is important to have comfortable conditions for a nap. The roller blinds are down, TV is off, and the windows and doors are closed. It starts getting cozy, right? Just add a weighted blanket, which significantly speeds up the moment you fall asleep, by evoking the feeling of being safe and applying gentle pressure on your body. You immerse into a good sleep with a sense of security and comfort. This time it will certainly be effective. Some people take a nap only when they are tired and sleep so much that they cannot function properly anymore. However, there are people for whom afternoon naps have become a ritual. This second group, more or less consciously, increased their chances for being successful in life. Remember that a nap improves your energy, concentration, creativity, awareness, memory and consciousness. Michael Simmon, who researched the habits of business geniuses, identified daily naps as a common trait. By the way, the link between a business genius and various habits does not only include naps. Additionally, financial success is also a result of regular reading, walking, keeping a diary and sharing ideas with others. Among those successful people whom appreciate naps: Albert Einstein, Thomas Edison, Winston Churchill, John F. Kennedy, Leonardo da Vinci, Napoleon Bonaparte (before the battles), Ronald Reagan (in the afternoon), Lyndon B. Johnson, John D. Rockefeller, Margaret Thatcher, Arnold Schwarzenegger and Bill Clinton. Let`s take a nap a day!